I knew better. But I was seduced. I had decided, at the end of the last season of BBC’s Sherlock, to stop watching it. I’d liked the first season very much. The second season I liked quite a lot. The third season alienated me. The production went from being a detective show (featuring lively riffs on the original Conan Doyle stories) into being a soap opera about the friendship of two men. I was particularly irritated by the condescending attitude I thought I detected toward the original material. As if Doyle had been waiting for the 21st Century for someone to inform him what he’d really been writing about. But then they offered a Christmas special, which aired last night on PBS, and they did it in period, set about 1895, with Holmes smoking a pipe again and Watson sporting a handlebar mustache. I couldn’t resist that, could I? What Kept Conan Doyle Going? Before he created the most illustrious residents of Baker Street—whom he nearly called J. Sherrinford Holmes and Ormond Sacker—Arthur Conan Doyle had already written a novel that was lost in the mail, and contributed excellent short fiction to various magazines. “The Captain of the Pole-Star” (1883), set in the Arctic, is one of the most haunting Victorian tales of the supernatural. But the young writer could hardly think of quitting his day job as a doctor in Southsea. A Study in Scarlet was turned down by one publisher after another, until it was finally accepted by Ward, Lock, and Co., who offered to buy the British copyright for a derisory twenty-five pounds. I ought to dislike the new CBS TV series, “Elementary” more than I do. 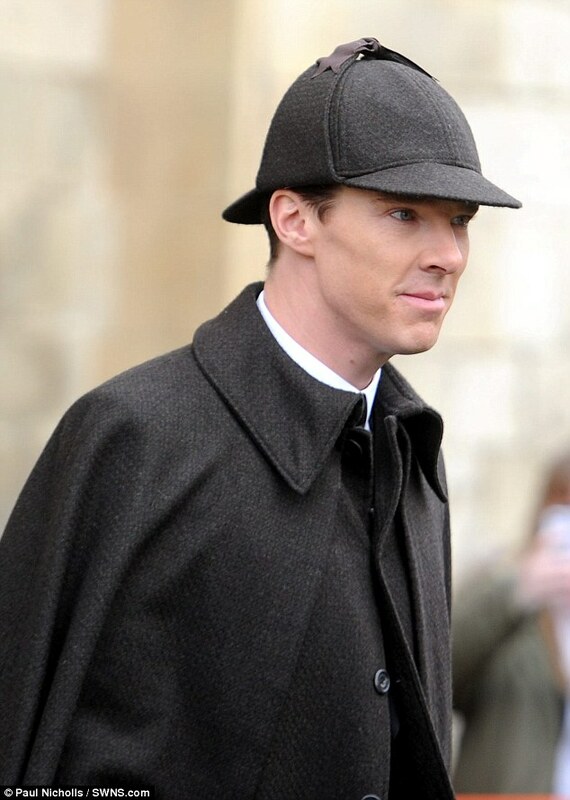 Conan Doyle’s immortal character has recently been brilliantly updated by the BBC in the series “Sherlock,” which extracted the soul of the character with exacting precision and inlaid him in the 21st Century with barely a seam showing. This American version (starring Jonny Lee Miller) is far more ham-fisted. It takes an attitude to the source material closer to that of the recent Robert Downey films (which I did not like), except for the martial arts stuff, particularly in adding a grunge element which the original Holmes, a fastidious dresser, would have sniffed at. Nevertheless, I think it’s the very crudity of the adaptation that makes it watchable for me. I can never take this character seriously as Holmes, so I can watch him with amusement as a vaguely Holmes-like TV detective. In this adaptation, the self-possessed, comfortably self-supporting character of the original stories is turned into a desperate drug addict who’d be living in an alley if his wealthy father (a character who never appears in Doyle) hadn’t hired Dr. Joan Watson (Lucy Liu) to be his companion and nursemaid in his exile in New York City. He worked as a police consultant in London before his breakdown, and in that capacity met Captain Tobias Gregson of the NYPD, who hires him for the same purpose here. If you think the idea of casting a woman as Watson is fresh and edgy, well, it’s not. The idea was first bruited by Rex Stout to the Baker Street Irregulars (the foremost Sherlock Holmes fan group) back in the 1940s. It’s been done before too, both on film and on TV. Actually it would be a little surprising if they hadn’t cast a woman in the role. And if you’ve got to have a female Watson, Lucy Liu is always nice to look at. As far as stories go, based on the two episodes I’ve watched, they seem to be adequate. Last night’s plot concerned bankers, which gave the writers the opportunity to have Holmes spout their favorite Occupy Wall Street talking points for them. But this Holmes is pretty deeply disturbed, so nothing he says not directly related to clues really needs to be taken seriously. In brief, I don’t consider this Holmes a real Holmes in any meaningful sense. But once you’ve made peace with that, the show is watchable. Sherlock Holmes, an ever-evolving icon, according to techgnotic. This article has a lots of artwork, from realistic drawings of the actors who have portrayed Holmes to comic-style caricatures.